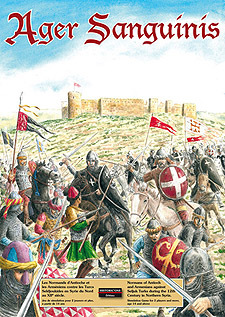 Ager Sanguinis ("The Field of Blood" in Latin) is the name of battle lost by Roger of Antioch in 1119. It is set in Northern Syria and simulates the fierce fights between the descendants of the Normans who followed Bohemond of Tarento, son of Robert Guiscard and founder of the principality of Antioch in the 12th Century. The game includes the various factions in this civilization showdown: Knights Hospitaller, Armenians and Seljuk Turks.